The year mark of my most recent visit to Israel quickly approaches. It was my fourth journey to the Jewish state. It won’t be my last. In fact, if I could, I’d have no hesitation to go there on the next plane. A few things made last year’s trip during Chanukkah very special. The first is family. Unlike my first two trips to Israel, this time I went back as a wife, a mother of three children accompanied by their grandparents, both sets. Seeing Israel’s historical and religious sites through the eyes of three generations was once-in-a-lifetime goosebumps every single minute. Secondly, we have Israeli friends. Friends from teaching. Friends made in summer camp. These friendships deepened our connection to the land of Israel more strongly than any tourist or archeological site. 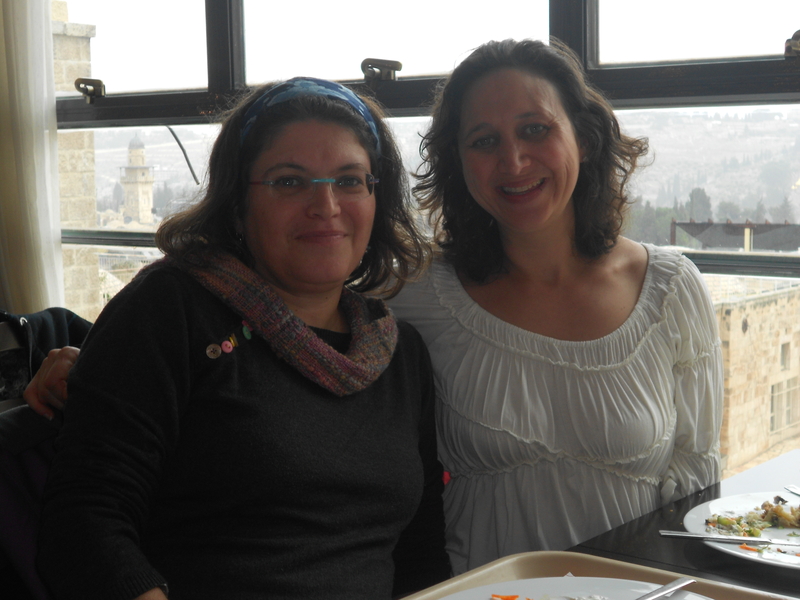 Nearly every day of our trip, friends met us for dinner or lunch in Tel Aviv and Jerusalem. My son reconnected with his friend, son of two rabbis, who met us for lunch after we celebrated my son’s Bar Mitzvah. Friends came and met us wherever we were on tour. They hung out with us on the beach near our hotel. My good friend from Modi’in met up with our group not once but twice. She’s An artist. A teacher. A true intellect. We have shared our different perspectives and deepened our understandings of what it means to be a Jew in America and what it means to be a Jew in Israel. I’ve connected with few people in my life as I have with her, though we will seldom see one another face to face. 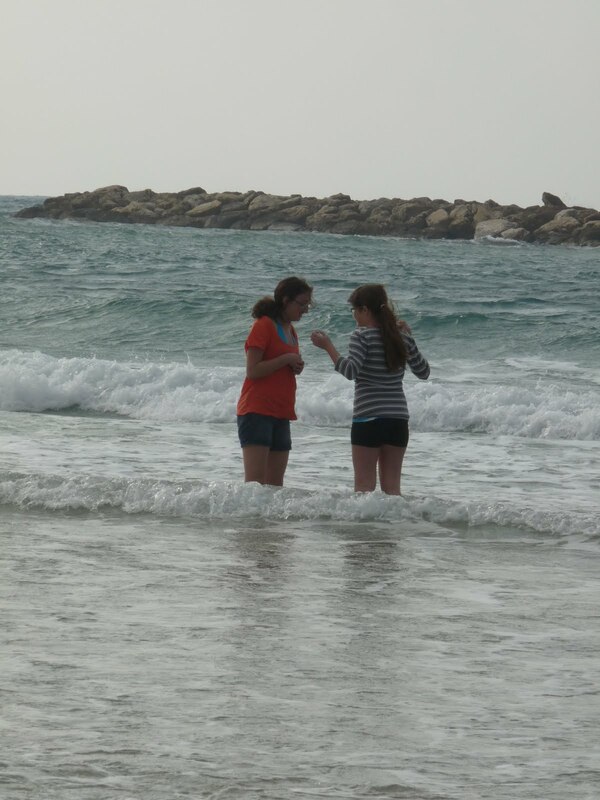 On a wintry day by Tel Aviv standards, we chatted on beach chairs with our spouses and watched our daughters play in the waves. 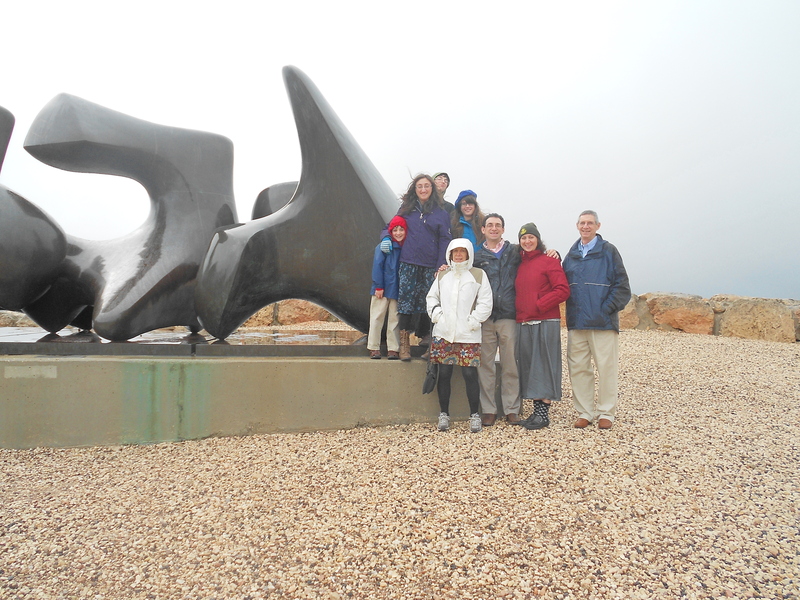 Or they accompanied us to the Israel museum in Jerusalem. There are the friends we did see and the friends we couldn’t see. I spent one night on a very long phone conversation with a friend from high school now living in Modi’in. At the time, she was newly diagnosed with breast cancer. All the plans we made almost a year in advance to get together, to spend time, to celebrate Shabbat, were reduced to that one phonecall. I was thankful just to be in the same time zone as her as I listened to her talk about the hard choices and treatments that lay ahead. Now. Now the bombs fall. When you have friends and family in Israel, focus on anything else has been nearly impossible. Eating? Making meals? Even taking walks? Just a temporary diversion until I can get back on the computer again and check in. I read an update from my tour guide who heard the bomb sirens and made it on time to the nearest shelter. I read updates from people who sleep with shoes on and who get tips on how to get to sleep again after they settle into their cot in their safety room. I read an update from my Modi’in friend, now done with chemo treatments but who must now train her daughters how to run to safety depending on where they are when the siren sounds. I read an update from my neighbor, now visiting in Israel describing what it was like to see the Kotel plaza evacuated. Is this any way to live a normal life? What is normal? Why must this be accepted as the status quo? What to do? Whether you’ve been to Israel a dozen times, or have never been there, whether you can name dozens of Israeli friends or never met anyone from the Middle East’s only true democracy, there is something we as freedom loving Americans can do. We can tell the world the truth. We can expose Hamas for their lies and their brainwashing. Social media can expose how Hamas truly operates as nothing more than a brain-washing hate cult that glorifies death enough to seduce its women and children into becoming human shields. When you have Israeli friends and family, the latest flare up between Israel and her Arab neighbors is not just a news story, it’s a personal attack. I know I’ve been posting about this nonstop if you follow me on Facebook. But please, don’t ignore Israel’s fight for hearts and minds. Their war on terror is ours. Do what you can do from far away to defend her. I guess Steve the check-out cashier figured out I was Jewish. After all, from my grocery cart, I unloaded a bag of potatoes, onions, some Chanukkah napkins, blue and white M&Ms and a box of beeswax candles. “Not much,” I replied. “Just going to my son’s band concert tonight, and then down to New York City for a family occasion.” I didn’t want to say it was for a Bat Mitzvah. That’s just too complicated if you don’t know what a Bat Mitzvah is. “Ooooh, New York City! That’s where they seriously get into Chanukkah! 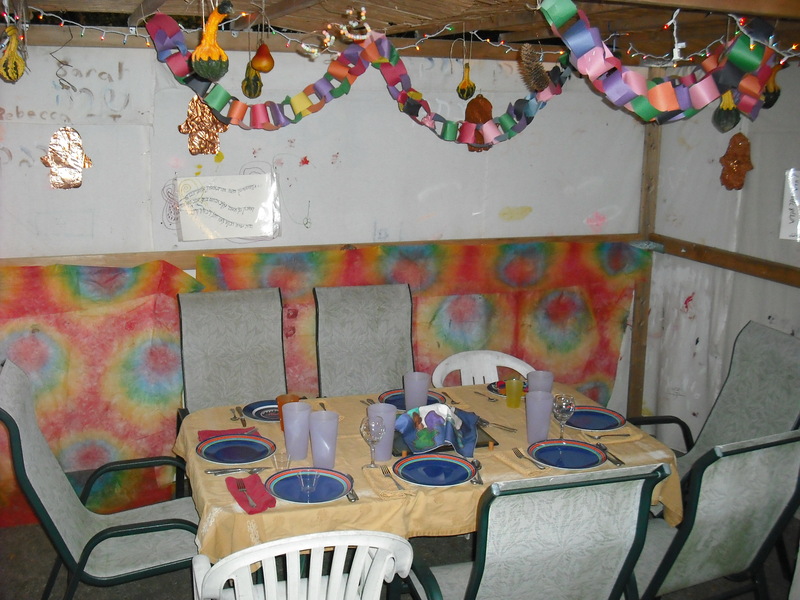 I mean, the big menorah displays, and the food — the matzah ball soup! Even in the diners, they make French toast out of challah down in New York City,” he went on. Now, you don’t have to be Jewish to love matzah ball soup or challah French toast. And, I am pretty sure, you can get challah French toast up here in Rochester. Now, this is not a question I would ask a complete stranger. But around this time of year, when the enormity of Christmas seeps into every crevice of the American landscape, Jews have this desire to connect to one other, to stick together. Judaism as a topic of conversation is a subject that would be avoided by the most disenfranchised, unaffiliated Jew for most of the year. But talking about one’s Jewish identity in the face of Christmastime, is, like a plate of freshly fried potato latkes, on the table and up for grabs. At any other time of year, a suburban housewife and a 20something college kid working in a grocery store wouldn’t openly discuss being Jewish. But that night, right before the lighting of the first Chanukkah candle, amidst the Christmas Muzak playing and the Christmas tree displays twinkling, it felt like the right time. As he carefully bagged my groceries with the expertise only possessed by a Wegmans employee, Steven continued to tell me his plans for the Festival of Lights. “Good for you!” I replied. This did my heart good. I told him that I worked for the Hillel – the organization that supports Jewish life on college campuses around the world – a number of years back. With so many negative statistics out there pointing out the demise of Jewish practice among today’s young American Jews, Steven telling me of his plans to do something Jewish, to be with other Jews that night, just made me feel all warm inside. 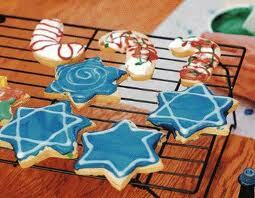 Chanukkah is such a small holiday in importance on the Jewish calendar. But it celebrates something so big – the world’s first fight for religious freedom. It was the first time a people – though meek and small – said NO to an occupying power. Judah Maccabee and his brothers were the first who had the chutzpah — the balls, if you will — to say, NO! We will not stop being Jewish. We will not stop teaching our children how to be Jewish. You can put up statues of your idols, you can outlaw Jewish practice, you can threaten us, but we will survive. And survive we did, and we have, in spite of history. 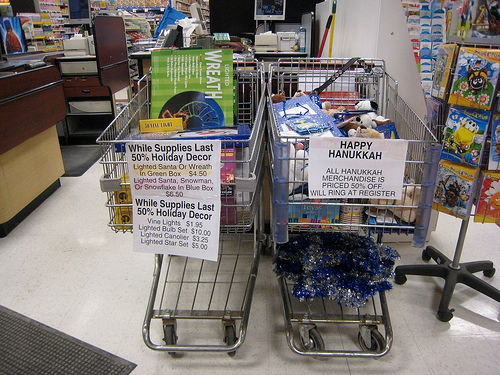 And in spite of the dreary outlook for the American Jewish landscape, Steven, the college kid who worked at Wegmans, was going to go out of his way to celebrate Chanukkah, to celebrate being Jewish. Happy Chanukkah to Steven and to all who celebrate freedom.